248 Marlborough is located on the south side of Marlborough, between Exeter and Fairfield, with 246 Marlborough to the east and 252 Marlborough to the west. 248 Marlborough was designed by Hartwell and Richardson, architects, and built in 1885 by L. P. Soule, mason, and John McDonald, carpenter, as the home of Dr. Wilbur Bates Parker, a dentist. He is shown as the owner on the original building permit application, dated April 22, 1885, and on the final building inspection report, dated December 15, 1885. Wilbur Parker purchased the land for 248 Marlborough on January 17, 1885, from real estate dealer Henry Whitwell, who had purchased it from the Commonwealth of Massachusetts on January 9, 1885. Click here for an index to the deeds for 248 Marlborough. 248 Marlborough was built with two separate entrances, with the address of 248-250 Marlborough. 248 Marlborough was Dr. Parker’s residence and 250 Marlborough was his dental office. 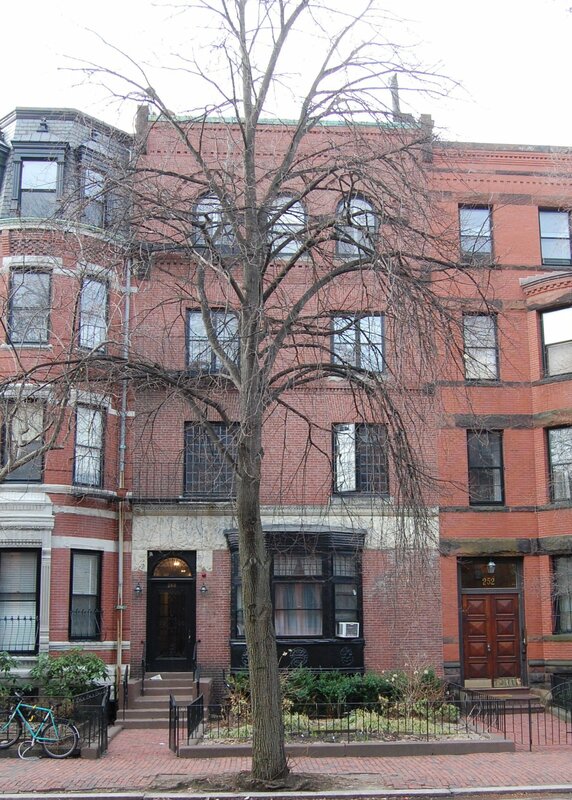 His cousin, Miss Mary F. Littlehale lived with him at 248 Marlborough. They previously had lived, and he had maintained his office, at 28 Chestnut. From about 1886, Dr. William Herbert Rollins, also a dentist, maintained his office at 250 Marlborough with Dr. Parker. William Rollins and his wife, Miriam (Phillips) Parker, lived at 399 Marlborough. 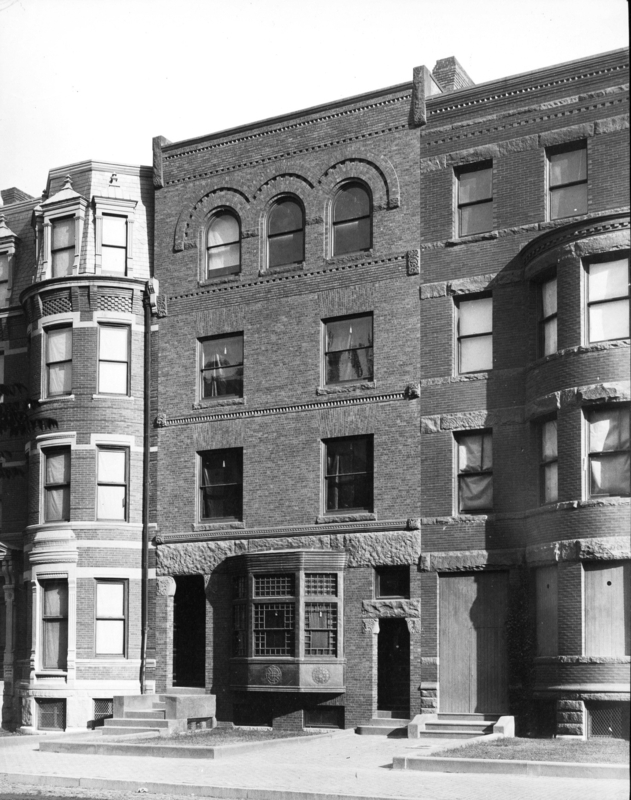 Miss Littlehale continued to live at 248 Marlborough until her death in June of 1904. In December of 1904, Wilbur Parker married to Allie Louise Howland. 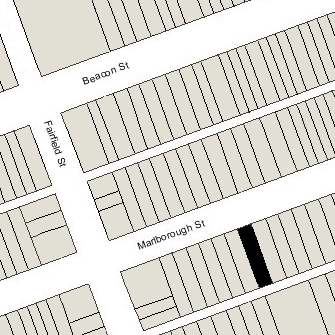 After their marriage, they lived at 248 Marlborough. 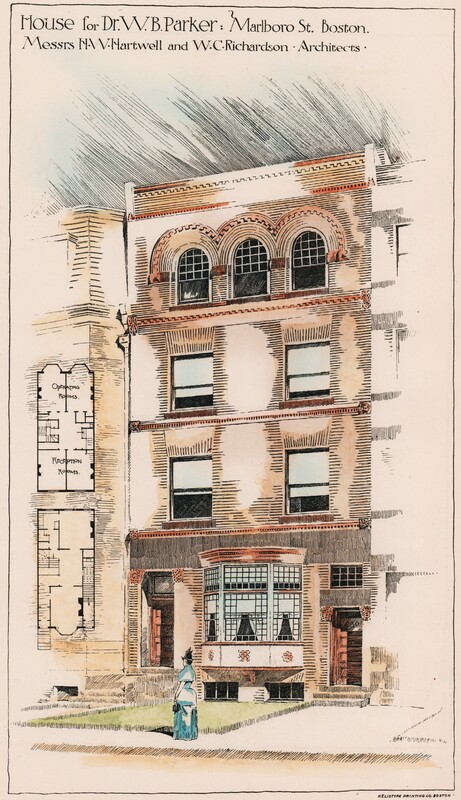 Dr. Parker and Dr. Rollins continued to maintain their offices at 250 Marlborough until about 1911. 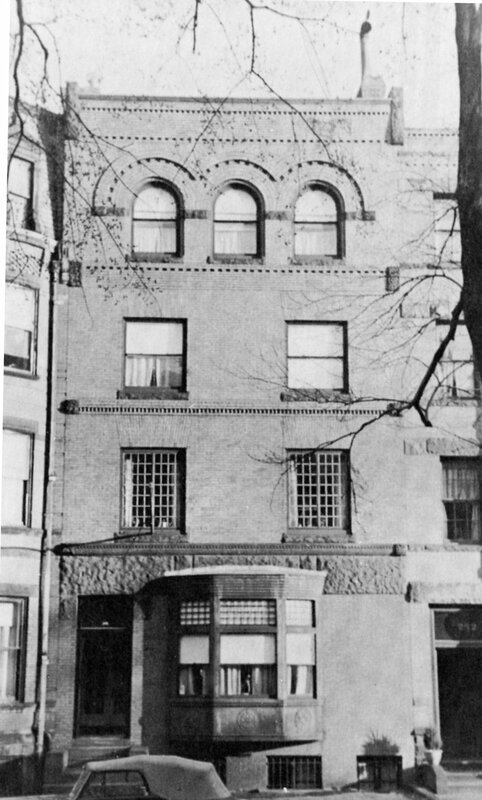 Wilbur and Allie Parker continued to live at 248 Marlborough during the 1912-1913 winter season, after which they traveled to Europe, making their home in Newton and then Cambridge after their return. On April 25, 1913, 248 Marlborough was purchased from Wilbur Parker by Barbara (Higginson) Wendell, the wife of stockbroker and investment banker Barrett Wendell, Jr. They previously had lived at 136 Beacon. The Wendells continued to live at 248 Marlborough during the 1918-1919 winter season, but moved to Chicago soon thereafter. On September 15, 1919, 248 Marlborough was purchased from Barbara Wendell by Ruth (Herman) Barnet, the wife of wholesale leather merchant and manufacturer Howard Jonas Barnet. They previously had lived in Brookline. They also maintained a home in Clifton, Massachusetts. In September of 1919, Howard Barnet applied for (and subsequently received) permission to remodel portions of the house. It appears likely that the separate entrance (250 Marlborough) was removed at this point (the application mentions a “new front door” but does not specifically mention removal of the separate entrance; the door had been removed by the early 1940s). The remodeling was designed by architect Harry E. Davidson. The Barnets continued to live at 248 Marlborough until about 1951, when they moved to the Ritz Carlton Hotel at 15 Arlington. On October 15, 1951, 248 Marlborough was acquired from Ruth Barnet by Mrs. Helen A. (Lawrence/Laurence) Durkin, the former wife of Oswald Joseph Durkin. She lived at 3 Fairfield. She appears to have converted the property into a lodging house, which is the use she indicated in July of 1952, when she filed for permission to install fire balconies. However, in August of 1952, she filed for permission to legalize what she claimed was the existing occupancy as nine apartments. It appears that permit was never granted. In April of 1959, Helen Durkin filed a new application to remodel the property to provide adequate egress, and to legalize its occupancy as nine apartments. In her application, she included a sworn statement that “when I took deed to this property on October 15, 1951, the building contained nine apartments.” This appears unlikely, inasmuch as it had been the home of Howard and Ruth Barnet earlier in 1951, and they and their servants were the only residents listed there in the 1951 List of Residents. On May 1, 1959, 248 Marlborough was acquired from Helen Durkin by real estate dealer Jack Fay (Jacob Fagelman) of the Fay Realty Company. On September 29, 1989, 248 Marlborough was purchased from Jack Fay by real estate dealer George P. Demeter, trustee of the Demeter Realty Trust. On August 19, 1996, 248 Marlborough was acquired from George Demeter by the Holmes Realty Limited Partnership (the general partner of which was Holmes Realty, Inc., of which Panos Demeter, George Demeter’s son, was president and treasurer). On August 31, 1998, 248 Marlborough was purchased from Holmes Realty LP by the 248 Marlborough LLC (Jerome R. Dangel, manager). In September of 1998, it filed to legalize the occupancy as ten units, indicating that “this has been existing more than 25 years” and that no work was required. It subsequently abandoned the permit and in December of 1998 filed for (and subsequently received) permission to remodel the ground floor to provide adequate egress and increase the number of units from nine to ten. 248 Marlborough remained an apartment building in 2016.